Futures pre-market were indicating a weaker open for the US Markets, with the Dow Jones, S&P500 and Nasdaq all in the red after disappointment in consumer data. The PCE price index, the Federal Reserve’s preferred measure of inflation, showed that price pressures seen earlier in the year have abated somewhat, with the index rising just 0.8% in the 12 months ending in March. Tech stocks have been hurting this week, with lower numbers from Apple and Twitter, however Ebay beat forecasts and Amazon is now souring pre-market. The Nasdaq 100 still remains weak. Shares of Amazon jumped 12.3 percent to $676.24 in premarket trading after the company’s quarterly results blew past analysts’ expectations. Crude Oil continues to push higher with price heading up to $46.50 per barrel in the Europe session. 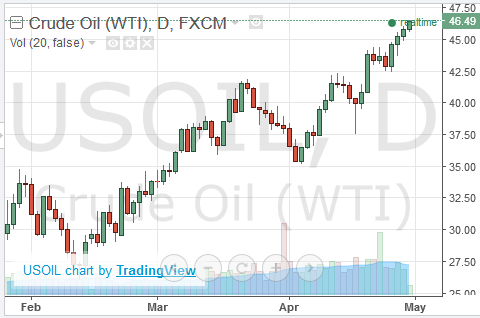 As the chart below shows, Oil is going parabolic at the moment, and doesn’t seem to be losing any momentum at all. Gold is also on a huge rally, and at the time of writing it is sitting at the high of 2016, and looking likely to break it. There has been a clear bullish flag pattern formed in Gold since early February, and that now looks to be coming to completion. All eyes will no doubt be focused on the big tech stocks once again, as the market opens. Facebook, Google and Amazon will be the most followed in early trade. With a rise of 12% pre-market it will be an interesting session for Amazon. Renewed Optimism From Europe Spreads To U.S, But Will It Be Short Lived?